Chicken feed accounts for more than 80% of the cost of poultry production. Right now, the increasing cost of feeds is driving many poultry farmers out of business. Making your own feeds would cut down costs while increasing the profit margin of your poultry farming. Today, I'm going to show you how to make your own chicken feed. Success in the poultry farming business mostly depends on feeding quality feed and feed formulation system. 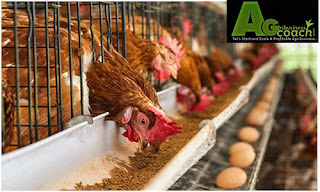 For proper growth, egg production and good health, poultry birds require energy. In order to obtain the desired growth rate, you must have to purchase and provide highly nutritious poultry feed. Except for adequate and quality feeding, you can’t run your business properly. As a poultry farmer, you should always produce and sell fresh and healthy birds and quality eggs. For producing quality eggs and meat you have to feed your birds quality feed. This will also help to get maximum returns from your poultry farming business. If you are planning or you are already into poultry farming and you wish to hit it big, then your poultry birds feeding is something you should take very seriously. Some farmers are now reducing feed rations served to their birds due to the high cost of feeds. Some of the feeds out there are adulterated. As a result, many poultry farmers in different parts of the country want to know how they can make their own feeds in order to cut down costs of production. Feeds account for more than 80% of production costs. A farmer who manages to bring down this cost to about 60 to 50% will make good returns in the poultry business. In the past, conventional thinking has been that farmers cannot make their own feeds, and especially to feed foreign breeds of chickens. But I came to understand that this mindset has constrained efforts of the more enterprising farmers who have the needed skills to make their own feeds. In fact, some farmers are already formulating their own high quality feeds on the farm and do not rely on commercial feeds whose cost keep rising every day. Besides, the quality of some feeds is so poor that poultry farmers using such feeds incur unnecessarily huge losses. Farmers who formulate and make their own feeds at home or farm save an average of ₦1000 for every 50kg bag of chicken feed, which is a great save for those doing commercial production. Now I'm going to show you how to make your own feeds and cut down production costs. Broilers have different feed requirements in terms of energy, proteins, and minerals during different stages of their growth.Therefore, it is important that farmers adapt feed rations to these requirements for maximum production. They require high protein content in their starter rations than in the grower and finisher rations. Broilers should have a feed that has between 22 – 24% digestible crude protein, DCP. You should add 10-20grams each of toxin binder, coccidiostat and growth enhancers like zinc bacitracin. The above feed formula contain metabolisable energy of Kcal/Kg=3038.80, calcium content of 1.19% and crude protein of 21.05%. 16kg of beniseed meal, groundnut cake, linseed meal, or cotton seed meal. Since the chicks are growing, chicks require feed with Digestible Crude Protein (DCP) of between 18 to 20%. Amino acids are important nutrients in all feeds in order to make a complete feed for all animals. For hybrid chickens, the addition of amino acids is very important to maintain a balanced diet for fast growth. it is very necessary that pullets should be provided with a feed having a protein content of between 16 and 18%. Such feed makes the pullet to grow fast and prepare for egg laying. 15.7kg of sunflower cake, groundnut cake or beniseed meal. Note: Layers’ feed should never be fed to chickens younger than 18 weeks as it contains high calcium content that can damage their kidneys (they can develop kidney stones), which interfere with egg production and also shorten their lifespan. Alternatively, you can start feeding your birds with layers mash when they start laying 5% of their total number. You may choose to add other additives for a better result if you want (like coccidiostat and other drug feed additives) but if you administer drugs you may not need to add. Note: Layer feed should contain a Digestible Crude Protein (DCP) content of between 16-18%. Calcium is important for the formation of eggshells (Laying hens that do not get enough calcium will use the calcium stored in their own bone tissue to produce eggshells which will lead to lameness). Layer feed should be introduced at 18 weeks. When making home made feed rations, it is important to do experimental trials. Isolate a number of chickens, feed them and observing their performance. If the feed rations are right, the broilers will grow fast and the layers will increase egg production (at least 1 egg after every 27 hours). Farmers should be very careful with the quality of feed ingredients or raw materials. Poultry, especially chickens are very sensitive to feeds that contain mycotoxins which are present in most of the raw materials. Never use rotten maize to make chicken feed. Buy quality fishmeal from reputable companies. If local fish meal is used, you must be sure of its quality. It is very important to mix all the micronutrients (amino acids) and premix first before mixing with the rest of the feed. 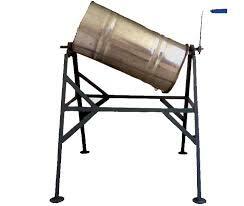 For mixing, farmers are advised to use a drum mixer (many welding artisans can make one). I will not advise using a shovel to mix feed because the ingredients may be unevenly distributed if you didn't mix properly. Use a mechanical mixer instead. Never use rotten ingredients to make feed. Rotten materials might contain mycotoxins which are harmful to poultry health. Small scale farmers in coperatives or in same location can contribute money together to buy feed ingredients in large quantities. This is because when you buy ingredients like maize in large quantity cost price reduces. They bcan also pull funds together to buy locally fabricated feedmill machines. Note: To improve on the feed quality, farmers making their own poultry feeds should always have it tested to ensure the feed is well balanced. You can take your feed samples to agro-allied laboratories for testing to ensure the feeds are balanced nutritionally. Are you having problems producing your own poultry feed or already producing poultry feeds by yourself? Please tell us using the comment box. We love comments. PLEASE click the facebook like button below and also share on Twitter . Sharing is awesome. ALSO subscribe to our blog to get future posts by clicking here then go to your email to confirm to receive our new updates. How does one get the raw materials for the feed? Which market in Lagos can I get them cheaper? How does someone get the raw materials for the feed? Which market in Lagos can I get them cheaper? Can anyone help me out with boiler finisher feed formula. Very informative, thank you. But im not sure what kind of lime is that to be used. Is it limestone or something else?